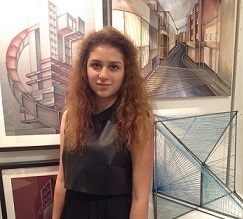 Our student Ariya Belokrylova graduated from Woldingham, a girls boarding school with excellent GCSE results. She got A*s (the highest possible grade) in all 11 subjects she had studied, earning her offers from two prestigious London schools - Highgate and University College School. Our student Ariya Belokrylova graduated from Woldingham, a girls boarding school with excellent GCSE results. She got A*s (the highest possible grade) in all 11 subjects she had studied. It is an exceptionally high result, and we are very proud of Ariya’s success, especially since alongside her studies in the UK Ariya also studied at an architecture school in Russia, which she also successfully finished. Her high grades and impressive results at entrance exams allowed Ariya to get into two prestigious London schools – Highgate and University College School, the school attached to UCL the university, for her A-Levels. Ariya decided to change her boarding school to a day one as her parents had moved to London for a permanent stay.